Coronoid process fractures are associated with posterior elbow dislocations. Generally an isolated coronoid process fracture is rare; most will have associated radial fractures. Recent authors have proposed the use of the radial head-capitellum view for the diagnosis of this injury. A Lateral radiograph of the elbow. 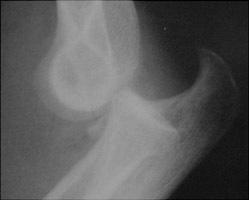 There is a posterior dislocation of the elbow with a fracture of the coronoid process.